Daniel Patrick Moynihan wrote the Guiding Principles for Federal Architecture and the proposal for the redevelopment of Pennsylvania Avenue, which President John F. Kennedy proclaimed on May 23, 1962. He served in the cabinet or sub-cabinet of four successive Presidents, the only person in American history to have done so. He was United States Ambassador to India and later to the United Nations. He served four terms as United States Senator from New York (1977-2001), sponsoring the legislation that created the Ronald Reagan Building and International Trade Center. Federal buildings should "provide visual testimony to the dignity of the American Government." "The development of an official style must be avoided. Design must flow from the architectural profession to the Government, and not vice versa. Where possible, buildings should be located so as to permit a generous development of landscape. "It should be our object to meet the test of Pericles' evocation to the Athenians? ?We do not imitate-for we are a model to others.'" Guiding Principles for Federal Architecture, 1962. Pennsylvania Avenue is "The ?grand axis' of the city, and of the Nation ? leading from the Capitol to the White House, symbolizing at once the separation of powers and the fundamental unity in the American Government." The city George Washington conceived "was not intended to be completed in the life of one administration, or one generation." As "the Capital of a great nation: building it would become the work of the nation." 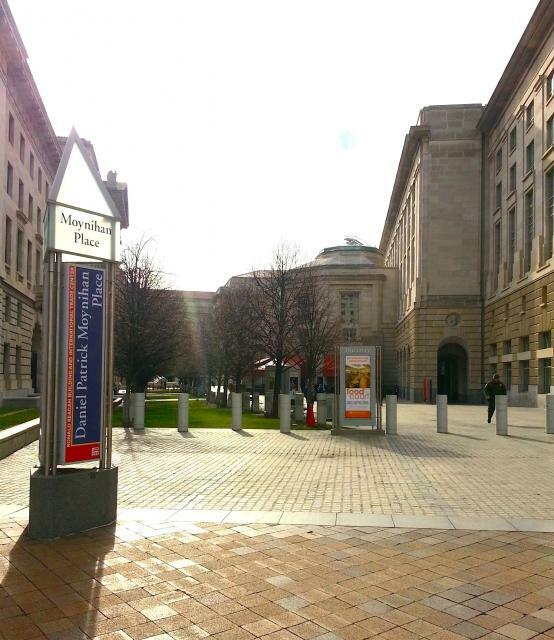 "Pennsylvania Avenue should be lively, friendly, and inviting, as well as dignified and impressive." The Redevelopment of Pennsylvania, 1962. This marker can also be identified by its HM code. You can use the hashtag #HMXGM in tweets, and any other place where you might refer to this marker, including when searching on this site.